Kottler, Carlson, What is Truth in Psychotherapy? Kottler, How Well do We Really Know Oue Clients? Carlson, Why I do What I do. Brooks, Treating Traditional Men: From Believer to Skeptic (And Back Again). Oren, Opportunities with a Side of Fries. Grzegorek, Smoke and Mirrors. Rosenthal, When Therapists Lie to Promote Their Own Agendas. Sperry, Duped, Drugged, and Eaten: Working with the Jeffrey Dahmers of the World. Dunham, The Client with Amnesia. O'Hanlon, Credit Denied and Denial. Hoyt, Never Ever - I Love You! Stevens, The Dance of Optimism and Skepticism. Helm, Grateful for the Lessons Learned. Burns, Cheating at Solitaire. Rochlen, What Clients Talk About - and What They Don't. Moore, Saving Private Joe. Dermer, Rita's Rib and a Puzzle Decoded. Ellis, Running out of Gas When You have a Long Way to Go. Vernon, Weighing in with the Truth. Barnett, Learning from Lies at the Therapist's School of Hard Knocks. Duncan, Cut the Crap: Tall Tales and the Value of Lies. Robey, The Terrible, Awful, Unspeakable Secret - and How it Changed Me. Barletta, Seduced by an Act of Omission. Zagelbaum, Too Much of a Good Thing. Eckstein, Managing Conflict Between Two Partners. Bitter, Mistakes Worth Enduring. Knaus, The Man who Tried too Hard to Act Cool. Peluso, I'm Not Easily Fooled. Nezu, Lost in a Quagmire of Agenda. Rabinowitz, Calling Jack's Bluff. Duba, A Puzzle with Missing Pieces. Reicherzer, The Transgender Women in the Pink Wheelchair. Krug, A Veil of Self-Deception. Waller, Clients Telling the Truth as They Know It. Stricker, I Still Wonder What Happened. Asha, In Defense of Naivety. Smith, The One Truth: He Didn't Want to be a Business Major. Fishman, Duped and Recouped. Walsh, Espionage and Orphans: Lies have Deep Truth. Niles, Fiction, Myth, and Illusions of Truth. 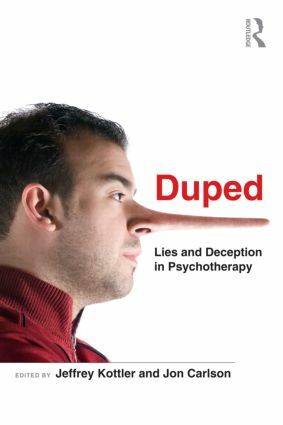 Kottler, Carlson, What does being Duped Mena in the Practice of Psychotherapy?